The Mahabharata of Vyasa – English Prose Translation is a single volume edition of the Mahabharata in not less than 5.818 pages. The translation was done directly from the Sanskrit source during the years 1883-1896 by Kisari Mohan Ganguli and this is often referred to as the comprehensive Ganguli translation of the Mahabharata. single volume edition of the Mahabharata in not less than 5.818 pages. 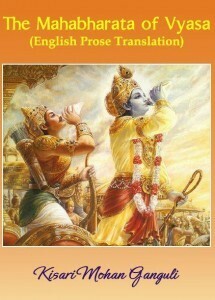 Edition: The comprehensive Ganguli translation of the Mahabharata. Too good work .. !!! The download process is a cake walk .. Thank you for keeping it so simple without tiresome logins, signups and Registrations !! Keep it up n going , bring more Hindu mythology related books, classical comics, etc..
You made easiest to download at one single click!!!!! thank u…….. i can download it so easily without login signup etc… thanks a lot……………..
Never experienced such a hassle free download of such a big volume. Thank you so much! Very, most excellent dear Sir, it was waited upon for 35 years, I can’t thank you enough. This is not one of the greatest epics of the world, it is the single by far greatest of all books ever written. Though poetic it portrays a real story in real time, centered in the effulgent personality of Krishna. Thanx a lot for making this epic available just at a single click. thankssss….!!!!!!! you made it sooo easy…. I am a huge fan of Indian history. A ton of thanks for your good work. May the blessings of the lord be with you. Thanks for making available this great book soft copy without any charges or registration timepass that others do. First of all I would like to thanks all those people for their relentless hard work and make it available to the whole world. On top of that, thank you for providing the holy book for free, please keep up the good work. Thank you sir,really A LOT. I have no words to thank the author. Both translations by Kisari Mohan Ganguli and Pratap Chandra Roy looks similar. eg, BOOK 2, section 4. Word by word same. Can anyone say based on which original Sanskrit text these translations were made. The Sanskrit texts available on the net seems to be different in meaning. For example in the above mentioned chapter it was said Yudhistir fed the Brahmins with Pork and Vension. But in the Sanskrit texts its only Ghee-Payas, Fruits and roots. Many translators from Sanskrit have not been Done properly. I heartily thank you for providing the complete version of Mahabharata that too free download. I am indebted to the author for such an exemplary work in the service of the people. can we expect kannada version of this or any other authors Mahabharata. thank you for the wonderful work…. may God bless you! Billions and trillions of thanks for this magnum opus ! I yearned to read it from years. Now , can read it for free. No pictures? Will I be able to find all these characters on google? Thank you so, so very much. I need this for research to defend Krishna and the Bhagavad-Gita. The war was a just war like with Moses and the Amalekites and Muhammad and the Quraysh. There are times when duty prevails over ahimsa, for evil must be brought to justice and not be permitted to roam free causing death and destruction. In Telugu original translation was done by KAVI TRIYAM? Ie NANNYYA AROUND 1046, Thikkana around 1312, YERRAPRAGADA AROUND 1411. LATER ON PURIPANDA TRNSLATED INTO PROSE TELUGU Around 1912.Latest by M V Subrhamnyam. is mahabharata tamil version is available ? Is this book in the public domain? Is it copyright free? Adi Parva – Chapter 23 is scanned partially – ony up to 18. Adi Parva – Chapter – 24,25,26,27,28 are missing. Scanning quality is poor, seems carelessly done towards the end.More pages could be missing. Please inform Google as this scanning was part of their project and they must have paid good money to someone to get this done. I am sure they will rectify if they come to know.